Back in the late ’60s, my Dad and a friend pulled up in the alley in a rented van. Inside, was his old drawing table from work that he picked up for $10. 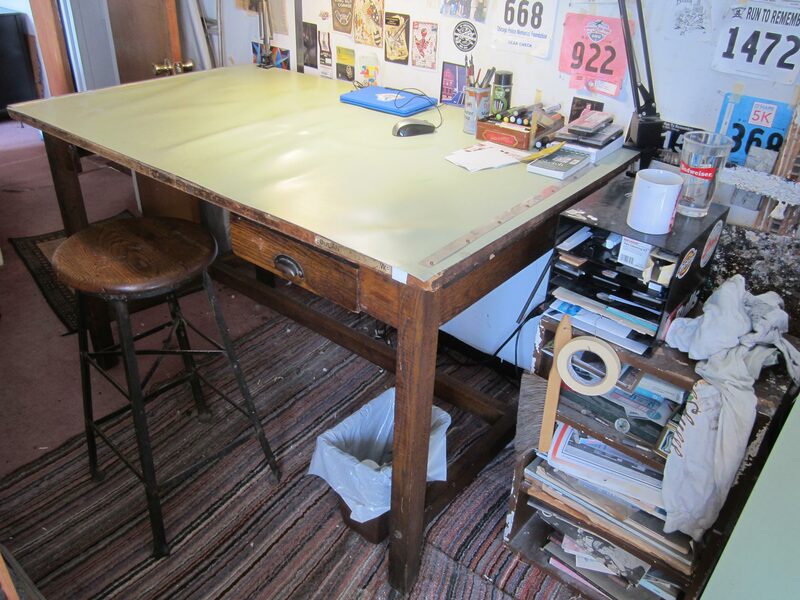 His company was remodling the office and that included a new drafting table. This old beheamoth of a table was a heavy 4-post architectural table from the 1920s at the latest. It had a heavy iron stool with a wooden seat. It probably wasn’t comfortable to sit on for 8 hours and contributed to my Dad’s back problems. It had been his work station for a few years. Bringing this piece home was his last attempt at having an art career. Like many people that have this dream, he got sidetracked with a family and earning an income at a real job. In his case his dream of becoming a famous a artist was being replaced by a career as a draftsman for an engineering firm. The table became the center of a studio that he set up in the front of the living room of our apartment. He would stay up late at night, drawing until he couldn’t take it. This lasted maybe half a decade, through another studio in the sunporch of our next apartment and finally in the basement of the family’s bungalow. However the lack of opportunity in the art world and energy, he became a hobbyist. The table saw less and less use. In the last decade or so, my Dad had trouble going down the basement stairs. The big drawing table was retired and replaced by a cheap modern table that was set up in my brother’s old bedroom. Now he and the newer table are in and assisted living facility with my Mother and the house is being readied for the market. So now the old table is mine. I hope to have many years of cranking out alley drawings on it. Every time I sit on the stool, I travel back to the old apartment, climbing up there in my PJs to see what my Dad drew the night before. It can be set at an angle.